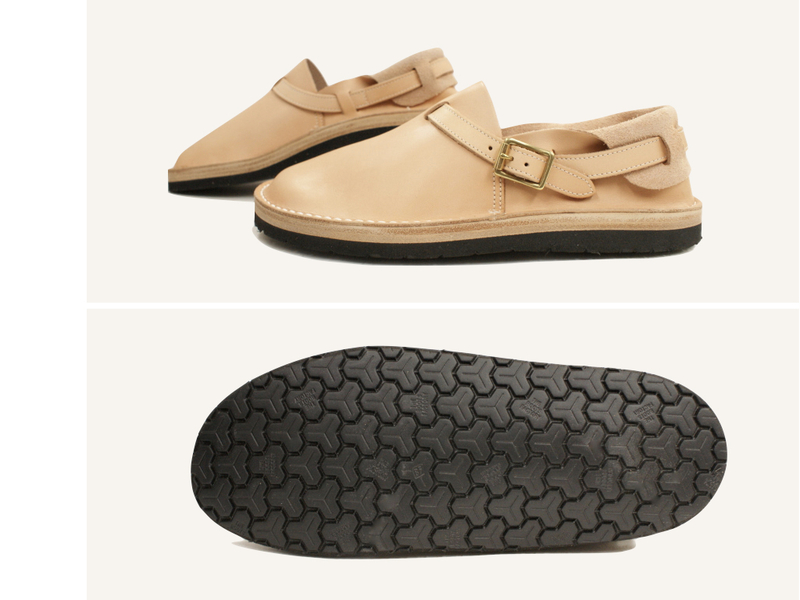 Exploring the same school of woke sandalry as brands like NYC’s Aurora, but measurably more obscure to western consumers, this is Tokyo Sandals. They appear to be unavailable in the UK or the US. Indeed even in Japan stockists are few, and outside of The Boots Shop in Tokyo and/or a lucky break through Rakuten it’d be quite something to snag a pair. This model is basically a sandal, but it’s got a back, so employing the technical terminology of the master cobbler, it’s a bit like a shoe. Personally, having had first-foot experience with a pair of backless Yuketen Bostons, I think having a back on your sandals is the way to go. I have persevered with wearing the Bostons, with socks, not just around the house, but in the wild, walking down the street, visiting the shops… And on every occasion the experience has been excruciating. Not, I might add, from a stylistic perspective, I like the vibe. They just won’t stay on. Trying to cling onto your footwear with your toes makes you feel like some kind of Neanderthal man, stuttering along the pavement, grimacing and gurning as your biceps sizzle. It is not a good look. These, I imagine, would provide a less combative walking experience. Sure they look heavy on the dreamcatcher/aubergine latte lifestyle, but worn with a pair of directional Japanese trousers (pointing in a direction that hasn’t been invented yet) a quadrasexual shirt and a liquid beanie you should be able to make something of them.